Rocky Patel lighter: synonymous with quality at a great price! Having "conquered the world of cigars", Rocky Patel has launched a new line of lighters specifically designed for cigar lovers. Rocky Patel lighters are innovative in design and heavy on the horsepower. From the industry exclusive 5 torch lighters to the innovative Rocky Patel Chairman Lighter with integrated cigar holder you can't go wrong with a Rocky Patel Lighter. 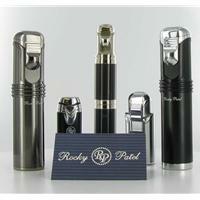 Looking to buy Rocky Patel Lighter? The Tobacco Barn is your source for great selection and price.